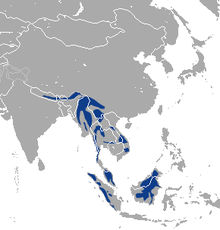 The Marbled cat (Pardofelis marmorata) is a small wild cat of South and Southeast Asia. Its head and body length is 45 – 62 cm (18 - 24") and it weighs 2 – 5 kg (4 - 11 lb). Genetic analysis has shown that it is closely related with the Asian Golden cat and the Bay cat, which diverged from the other felids about 9.4 million years ago. Therefore, it may probably be transferred to the genus Catopuma. Its tail is extremely long and bushy. The background color of its fur varies from dark gray-brown through yellowish gray to red-brown. The flanks and back are strikingly marked with large, irregular, dark-edged blotches. The legs and underparts are marked with black dots, and the tail is marked with black spots and rings. There are spots on the forehead and crown, which merge into narrow longitudinal stripes on the neck and irregular stripes on the back. The marbled cat is found in northern India, Nepal, Guangxi and Yunnan provinces in China, and south through Cambodia, Laos, Myanmar, Thailand, Vietnam, peninsular Malaysia, Sumatra (Indonesia), and Borneo. Throughout its range it is thought to be rare, although it has also been suggested that the perception of the marbled cat's rarity may be caused by its secretive nature and its preference for remote forest areas. This page was last changed on 9 March 2017, at 13:37.